Arpeggio of Blue Steel: Ars Nova is the next fall season anime I've been watching to cross the finish line. It is a show about Cylons mental models, ships, sci-fi weaponry, and endless shipping jokes. So, the only question that remains is was it awesome or terrible? 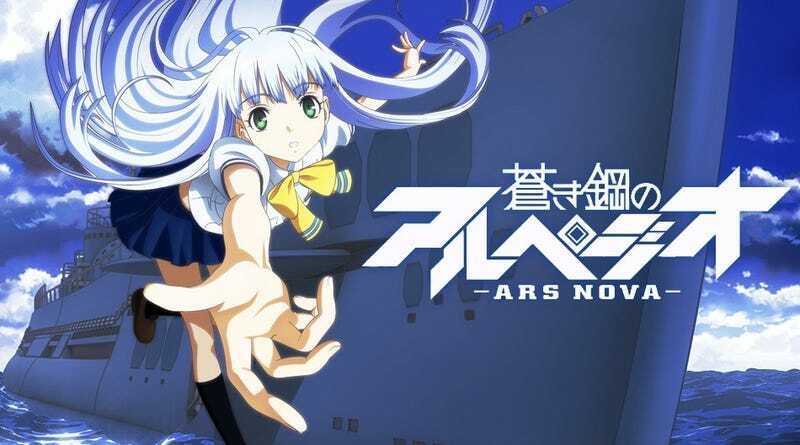 Apreggio of Blue Steel: Ars Nova is a loose adaptation of the Arpeggio of Blue Steel manga that follows the crew of the submarine I-401 (historical knowledge bonus) in the broken world that is Earth. The oceans of Earth have been occupied by an unknown hyper-advanced naval fleet known as the "Fog" for seventeen years. The Fog doesn't attack humanity on the land, but any attempt to leave the shores is violently put down. In addition, lines of communication (including satellites) have been severed by the Fog. This has resulted in the world economy and global communication completely collapsing. Japan once relied on imports and exports to strength their economy but no longer can. As a result, the entire system is fragile at best. In the years since the world's navies were destroyed, the Fog has changed a bit. The many ships of the Fog have created so-called "mental models" which are projections of themselves much like the reimagined Battlestar Galactic human-form Cylons. Naturally, all the mental models are women because human lore they find refers to ships as women. Oh Japan, you sly dog. You made a justified excuse to have ships and women in the same package. You get cool points for managing to do it. And in the process gave shipping a whole new, amazing meaning. My fellow tropers on TV Tropes could write a book on how many puns and jokes have been made using this. Arpeggio is a short and sweet anime. It is only 12 episodes in length and it is pretty packed with things for the viewer to chew on even long after you've closed the tab in your browser. It's fun-loving and fanservice-laden, but it's also strangely introspective and aware of its subject material. It never gets too grim for the average viewer, but it also doesn't slack off in the themes department. There are some implicit themes like friendship, change, and understanding that are being explored in Arpeggio that just seem to work really well when coupled with everything else. To back this up, the plot is good too. It takes these themes and absolutely runs with them. In the foreground of the series you'll see fanservice, big explosive naval battles, and a whole bunch of awesome-looking sci-fi weaponry. In the background you'll see a whole mess of commentary happening on what "life" is supposed to be and if "change" is a flaw or an opportunity. Sure, it might seem like shallow fanservice at times, but I loved how they have a pretty complex mesh of thematic brilliance happening in the background. At least some of these themes were done in the dark and gritty Battlestar Galactica reimagining on the Sci-Fi Channel (damn right I still call it that). It isn't a stretch to say that Arpeggio of Blue Steel is kind of like a lighthearted version of BSG at times, at least thematically. The only thing we're missing is a character voiced by Tricia Helfer (hint hint, you'd better do it dubbing company). In addition, the opening theme for Arpeggio of Blue Steel grew on me significantly as time went on. I started out a bit mixed about it, but it quickly became one of my favorite openings of the fall season. Warning: Dex gushing about a show ahead. Oh my god, this show is awesome. I can't express why I think it was awesome. It isn't any different from the endless series about spaceships with spaceship girls, but I loved it so much. It has big ships, Cylons, and giant sci-fi guns. All of that and more makes it awesome. It certainly helps that there were some great crowning moments of awesome (Iona in the last episode is a very apt example) and a couple of (brief) tear jerker moments in the series too. Everything that the show is doing just seems to fit extremely well into a nice, small package. The protagonist might be the captain (well, maybe, this actually depends on who you ask), but the real stars of this show are the ships. I can't believe I just wrote that. I can't, but it's true. Takao, Kongou, Iona, Maya, Haruna, and Kirishima absolutely steal the show at every chance they get. It is pretty damn incredible that a show that seemingly is about humanity taking back Earth evolved into a show about a bunch of AIs grappling with change and the meaning of life, perhaps to a far greater extent than BSG before it. This is probably one of the reasons it ends up being awesome, yet again this might be an example of Japanese sideways storytelling gone right. The human story is a framework for the narrative, but the themes that are being explored between the ships of the Fog are front and center. Like so many of these shows, the fanservice can feel really over-the-top and out-of-place sometimes. These moments usually involve Takao or Hyuuga and they are pretty frivolous and out there almost every time. They can be a bit uncomfortable and strange sometimes. Nevertheless, it isn't too bad in general. It can be overlooked. In the same vein, some of the elements of the show are a bit too childlike. I'll just mention the teddy bear and you'll know what I mean when you get to it. The animation quality of Arpeggio of Blue Steel will polarize some people significantly. Some will love it, some will be neutral, and some will hate it with passion. Arpeggio is one of the few anime series that has opted to go full CG. The scenes feel a bit strange at first because of how the shading and frames are drawn as a result of this. This carries through to every scene of the show clearly. You'll either like it after a while like I did, or you'll just have to tolerate it. The plot moves pretty quickly too. There isn't much time lent to explanations for several things and the exposition on some elements can be a bit lacking at times. Some plot threads tend to drop off the radar, come back, and then quickly drop back off as needed without so much as a lampshade or hand wave by the characters. Arpeggio of Blue Steel was a nice anime, one of the highlights of the Fall in my opinion. It has everything it needed to make a show work: action, a bit of harmless fanservice (most of the time), surprisingly deep themes, and a distinctly likable cast of characters. Sometimes it slipped a bit and ended up coming across a bit too on the lighthearted side, but Arpeggio has surprising depths to it. It channels some of the themes about artificial intelligence that made the reimagining of Battlestar Galactica good. It also adds in some seemingly silly themes about friendship and the complexities of not knowing your own purpose. All these themes manage to come together seamlessly with the framing plot and the characters themselves. Sometimes things might seem too "convenient" or too "childish", but it is usually forgivable to some extent. This is best for someone that likes the idea of a show exploring artificial intelligence and the meaning behind life and change. It has action, naval battles, some sci-fi, and a good dose of humor. On the other hand, it can be lighthearted sometimes with its friendship themes, which might not resonate with some. They do push quite a bit of fanservice to the foreground, so be prepared for that. Generally speaking though, this is one of the good, maybe even great, series to come out of the fall 2013 season. I wonder if we'll get a second season? Arpeggio of Blue Steel is available for streaming Crunchyroll. A Gundam series is on deck. Code Geass is on hold because I've gone off schedule because of delays. Totally forgot that Arpeggio of Blue Steel was ending today, so I didn't mention it last time!